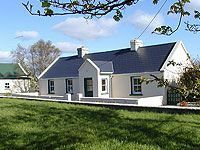 Old Farm Holiday Cottage offers Self Catering Holiday Accommodation within 1.5 miles of Sligo town. This Recently renovated 3 Bedroom Cottage has been finished to a high standard and is located in a very scenic location. Lough Gill and Holy Well 10 minutes walk. Rosses Point and Strandhill beaches 10 minutes drive. Large mature garden with apple trees and swing, make this ideal holiday accommodation to rent for families. Quiet location. All mods cons including Satellite TV, DVD Player, Playstation 2, Dishwasher, microwave etc. Bicycles and Travel cot supplied, Ample parking. Hens on site for free range eggs every morning! Follow Old Dublin Road to GAA pitch (Markievicz park) Turn up by pitch and follow road for 0.7 miles. The house is first house on the left passed Scenic Drive.